As the interest in start-up companies is increasing these days, crowd funding has become a great deal. Crowd funding is a type of funding where the general public can invest in small businesses in a form of donation. 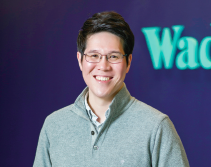 We had a chance to interview Shin Hye-sung, the CEO of ‘Wadiz’, the No.1 crowd funding intermediary company in South Korea. Q. What triggered you to start a business based on crowd funding? A. Crowd funding refers to a process of getting funds by a group of people just based on trust and faith. By using this, I wanted to change the reality where new companies that have great ideas cannot get funds without guarantee. Q. You have said before: “Invest in something you like rather than something that can make money.” What does this exactly mean? A. It basically means that if you like something, you know more about it. When it comes to investing, it is essential to know about the business very well. The more you know, the more rational you can be when it comes to making investment decisions. This is the fun of ‘Wadiz’ funding. It is a whole cycle of people investing in things that they love and making profit out of it. Just like our slogan, ‘Better Funding, Better Business, Better Life’. the concept of crowd founding? A. The focus in businesses all over the world is changing from large corporations to giving the spotlight on start-up companies. Thus, investors need a change in where they are goingto use their money. Unlike how it was hard for the general public to invest in these start-up businesses due to the lack of information before, we are trying to make more opportunities for both the public investors and new born businesses, by being a great investment guide and providing the information that they need. Q. Are there any big plans or aims of ‘Wadiz’ for the future? A. We are going to introduce products from overseas and domestic markets to each other as well as advancing to Singapore and entering the Japanese and Southeast Asian markets. Offline businesses are being reviewed and we are preparing block-chain based services for the global market. Q. The education of start-ups is booming in Hanyang University at the moment. Is there any advice that you could give to the future business founders? A. You need to classify risks and dangers well because as a founder, you need to take both risks and dangers. If there is a new opportunity but has danger within, it is a risk, while danger is predictable and removable. You do not need to take the same path as others; everything starts from knowing what you like and what you are good at. Also, always try to improve the parts of you that are insufficient and you will definitely find a place in society that is just for you.